The newest name in the Ring of Honor Death Before Dishonor pack is the 2017 Top Prospect Tournament winner Josh “The Goods” Woods. Josh is a 4-time All American wrestler and has extensive MMA training, so it’s no surprise the success he had when entering Ring of Honor. Woods continues to build his pro wrestling credentials and with his talent is sure to be a future championship contender. 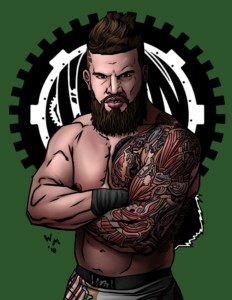 Josh Woods will join Marty Scurll, Jonathan Gresham, Sumie Sakai and Brian Milonas and four other wrestlers in the Death Before Dishonor 8-pack. Preorder ROH: Death Before Dishonor now HERE and check out all our holiday releases HERE. Games begin mailing December 14.